Episode 110- USCF Master Michael "F-pawn" Aigner"
USCF Master Michael Aigner is a player and coach who is well-known in the Bay Area of California. He has coached many future titled players, and also holds a master's degree in Mechanical Engineering from Stanford University. Thanks to Michael for an informative and inspiring conversation. Read on for details of all that we discussed. 0:00- Intro and quick discussion of how the Bay Area teams are doing in the Pro Chess League. What distinguishes Michael’s coaching style? Amongst his favorite games to share are those of Mikhail Tal, and any game between Carlsen and Aronian. 8:00- How did Michael get into chess as a teen in the early 1990s? How did he get better quickly in the pre-computer age? (There were a lot of early losses involved.) Michael was not a big chess book aficionado but he learned openings from an encyclopedia called Modern Chess Openings and was a big fan of the book Mikhail Tal’s Life and Games. 18:50- Michael shares some of the advice he generally gives his students. For example, he thinks 15 minute chess is a good time control to practice online, as it is fast enough to be able to play multiple games, but slow enough to have educational value for the player. What was it like for Michael to coach future GMs Daniel Naroditsky and Steven Zierk? Michael tells some great stories to illustrate the tenacity and enthusiasm that these top players showed at a young age. 27:30- A brief discussion of what scholastic chess teachers and US Chess can do to help chess players retain interest in chess past their teen years. 31:00- Michael discusses the special role that chess plays in his life due to his physical condition, called quadrilateral phocomelia. 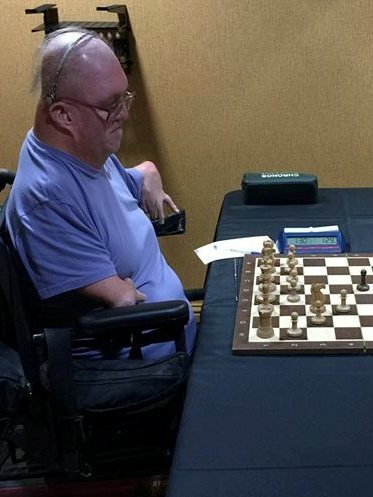 As Michael discusses, this condition means that he gets around in a wheelchair, but this definitely does not deter him from competing over the board. 37:30- Michael answers a question from a listener about how he handles wheelchair accessibility issues in his tournaments. 44:30- Michael answers another question from a Patreon supporter of the podcast, about whether he would recommend chess as a hobby to others with physical disabilities. 48:00- Michael tackles a list of questions sent in from Michael’s friend and sometime opponent, Stewart Katz, relating to chess teaching and competing. 1:00- Michael discusses how he follows top level chess and names a couple of his favorite chess announcers, plus he gives his take on whether the World Championship format should be changed. 1:06- Wrap up and contact info for Michael Aigner- You can keep up with Michael on his website, Facebook, Twitter and his blog.